There is a great moment in a live Neil Young recording when he announces the next song and a heckler shouts out "Neil, they all sound the same" and without a pause for thought Neil slaps back "That's because it's all one song". 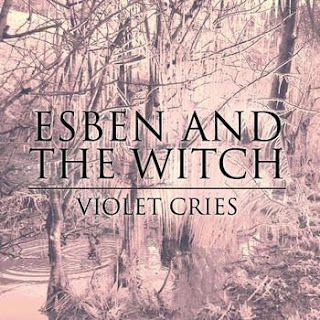 So it goes with 'Violet Cries', the debut album from Q magazine "Next Big Thing" and BBC "Sound Of 2011" nominees Esben And The Witch. The album is dominated by the vocals - part Jarboe, part Patti Smith - of Rachel Davies riding on top of layers of atmospheric guitars, keyboards and various percussion. This certainly binds the album together but does also create the impression of listening to one extended song - a bit like a seventies concept album - and ultimately the success of 'Violet Cries' depends to a large extent on how much you like those core ingredients, as opposed to delivering a clutch of memorable songs. On the plus side it is excellently done and the lead-off (and only obvious) single 'The Marching Song' is a real standout - great dynamics, shifting through the gears to a genuinely thrilling resolution. But I find too many of the songs don't really go anywhere except to the next one and for every compelling story ('Argyria', 'Hexagons IV', 'Chorea' are all terrific) there's a lot of meandering which is only suits if you're in the mood. Now I did want to like this album - the 'The Marching Song' EP is a fine effort with just the right blend of creepy atmosphere, great dynamics and interplay between voice and instruments and I think both 'Souvenirs' and 'Done Because We Are Too Menny' from that EP are stronger songs - and much more interestingly produced - than several on 'Violet Cries'. I can understand the commercial pressure to get the album out while the band are hot but despite a strong opening, it seems like the material is stretched to breaking point and the almost overwhelming presence of the vocals becomes a bit tiresome - I'd very much like to hear a Steve Albini remix. So there's the rub - either you see an original album marred by too many weak songs, or you take it as a whole, a magnum opus, and appreciate the entirety of its statement. I am in the former camp, but I'm sure there are many who will disagree with me. 'Violet Cries' can be streamed for free in the widget above. It is available to purchase from amazon.co.uk or can be pre-ordered at Matador's site for international readers.